Oradour sur Vayres to St Saud Lacoussiere. A long day we knew it would be, campsites seem few and far between in the forests on the watershed, 23 miles from 0740 to 1630. Thanks to Peter at Maison Taupe for getting up to get us started early. A good breakfast always starts the day well. Pleasant walking through the woods and fields mostly shaded. We made a great landfall in Pensol at lunch time. We tried to make it for1300 in case there was a picnic table to eat on, it’s only a small village, there was and a bar and public toilets and a map of the surrounding area with some useful walks on it. Full marks Pensol and most unexpected. We then continued on the GR 456 to the point where it formally diverges from the GR4, the way at this point as we knew is one of the major pilgrimage routes across France and sign posts seem to have been adopted and we presume paid for by Gas de France. Tonight’s campsite is one of the most expensive at 18Euros (perhaps we have been spoilt by the small municipals at under 5 per night). But tomorrow we stay in a real Chateau that welcomes pilgrims and does Chambre D’Hotes with reductions, first we have to get there, another big day. Longish day planned and early start with no breakfast, walking at 0640 and 7 miles to St Auvent along green lanes mostly through forest, pastries and coffee at the Auberge by the church were well needed. The next 8 miles or so were road walking with the day gradually warming up and a gradual ascent to over 1000 ft during the day as we passed out of the watershed of the Vienne draining north to the Loire and into the area drained by the Dronne and other rivers filling the Dordonge that enters the sea in the Gironde estuary home of the great Bordeaux wines. We are really well down France now and we start to feel that we might finish this walk. We stopped for lunch in the shade on the side of a farm track by a lake and didn’t start again till 1330, the heat was not too bad today as the humidity was much lower but we were encouraged by the fact it was only 2 miles to town and a cold beer. After that and a bit of shopping for food for tomorrow we moved on 1 mile to our Chambre d’Hote for tonight run by Peter and Barbara at Maison Taupe (Mole House), who are once again English who have been here 6 years in a classic old French house and well maintained garden in which on their washing line our daily washing had dried well before the evening barbecue. Tony mean while seems to be earning our beers by trying to help Peter sort out his web site. Freddie there’s a bird ID for you, see separate post. We have a big day tomorrow to tomorrow’s campsite so good night all. Correction for yesterday, it was Tracie & Kieth who owned the campsite. Sorry for any confusion caused. Early start after yesterday to try to avoid the heat, walking by 0645 but no breakfast until 0900 when we reached Pressignac a nice little village with a good bakery, the French seem to have become even more obsessed with bread over the years and it seems they all vie with each other for the greatest range of breads and pastries. We had reached there as straight as possible via the GR48 on green lanes and country tracks but the route then started to duck and weave first to a mill to cross a sizable stream in valley bottom then all over the ridge leading to the valley head and the town of Rochechouart. This was over the border from Charante and into Haute-Vienne, we had thought this would give us better info but it was still difficult as we cross not 2 but 3 different departments around here as we soon to be Dordogne. Although the English of the ladies in the tourist office was very good and they tried hard to find us campsites they are in short supply on our line of march. So we have two nights out of three in indoors accommodation, one of which however is in a chateau with reductions for pilgrims. 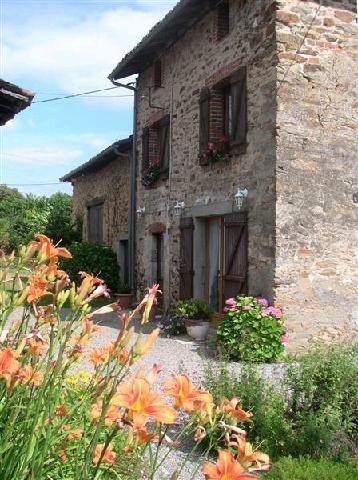 We are for that short period on another main pilgrimage line to Bordeaux and Saint Jean Pied de Porte. We await with interest their views on our DIY route down France. We arrived in Rochechouart in time for lunch and a look in the fine church this has a spiral tower like Chesterfield and proudly belongs to the European society of spiral church spires. Campsite down the hill and the usual rituals of setting up camp, washing and a brief dip in the pool ensued. We seem to have enough info to know now that we will meet Geoff on Sunday in Brantome about 12 miles north of Perigueux which should have a rail link to Bordeaux. Early start, 0700 too early for the boulongerie in Confolens so walk 2 miles to Ansac sur Vienne to cross the Vienne for the last time and to get breakfast and our lunch baguette just as the bakery there opened. We are gradually ascending to the watershed with the Dordogne to the south now although today was hardly record breaking at around 250 m. We will also cross department boundary again from Charente to Dordogne and this gives some problems in identifying campsites for the future and hence our rendezvous with Geoff . Hopefully tomorrow we shall have some solid info for the next few days walking. It was a hot day after about 1100, we had done a short section of old railway line (used for the velos) after breakfast to cut a corner of the GRs wanderings and although the route was well marked through mainly green lanes as the sun rose so did the humidity and temperatures. We crossed the N141 road which was a big shock tot system. Where had all this traffic come from? We had had lunch and covered about 16 miles when the well signed route became not signed at all and the decision we made to strike back to the road was probably right it added another mile or two. It was a hot and thirsty pair looking for a beer in Suris which really is a ½ horse town, we passed through, found the sports ground outside town, but no campsite. Fortunately directed by workmen on the sports ground it was only another 400 yards. We made our landfall and were about to set up tents when we were accosted our usual poor quality French was immediately recognised for what it was and we were told we could speak English. Penny and Peter are British expats running the campsite Les Blanchies at Suris for the last 6 years, the bar was opened and we got our most welcome biere. 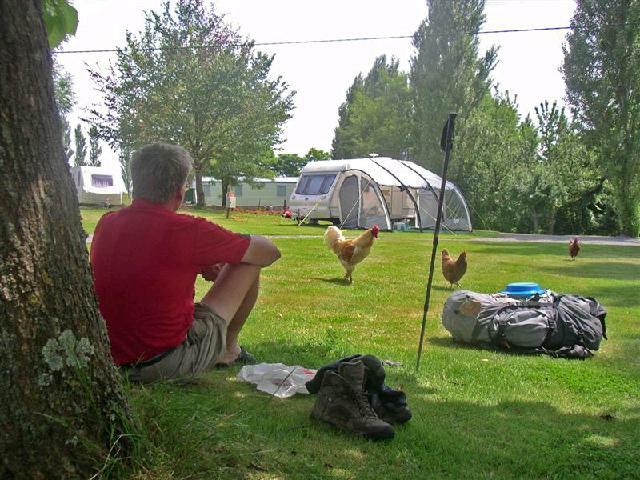 This is a very pleasant welcoming site, even the hens came to inspect us as we put up our tents. A short day planned to allow us to get to Confolens in time for lunch, as recommended by an elderly English couple who have been touring this area for 20 years, in the Café du Gard. This is one of those French places frequented by locals, from the pompiers to the painters (of houses), 11.5€, 4 courses and ½ litre of wine red or rose, no choices apart from the 1st course buffet. Excellent value for two hungry walkers who had nearly run out of food. We rejoined the GR48 after a short walk uphill, some thunder in the night but much drier than the previous morning. The ups and downs of the previous day started again with some green lanes badly in need of fauchage, followed by more along the bank of the Vienne, flatter but with wet bracken and bramble already overhead in places. We startled a young dear on one of the tracks, who stood and looked at us for some time before deciding that he had better be on his way. However it was cloudy with a slight breeze and nowhere near as humid as yesterday so we cracked on at a good pace emerging via the local quarry (in operation) at St Germain where we had a coffee on the bar (again just out of a thermos but not as bad as previous day’s brews) and then took the road , with only light traffic, and signs asking motorists to share the road with cyclists (but walkers fair game), to Confolens and into the next campsite by 1100 from a start at 0715. We spent a few minutes talking to a Dutch guy who was walking sections of the GR48 who agreed that the walking was excellent in the area. Up with tents to dry in the hot sun and we soon found the Café du Gard opposite the old station on the left bank after crossing the bridge over the Vienne that, although not in its present form, dates from Roman times. The railway here is now unused but the lines still exist and a local group of volunteers run a rail pedal car hire service (Velos Chemin de Fer). We could not ask what you do if you meet someone coming the other way so thought better of hiring one. After lunch on the way back we visited the two local churches both very old, two because the two halves (Chabannas and St Germain) of Confolens, like many of the little towns up the rivers in this part of France were separate parishes and the bridge only used by commerce and military not by the common people. Both were obviously in regular use and were cool and one beautifully lit from several fine stained glass windows designed by the Carmelite nuns of Tours in 1866, (not as good as the Dennys in Tewksbury and Gloucester). The second had an accessible bell tower that, of course, had to be climbed, via two tight long ladders. The bells with their strikers and electronic controllers for the chimes (an essential function of every church in France) make an interesting contrast in times. A wet night with thunderstorms still raining at start time, but will probably be hot again so better get started. Breakfast in the toilet block while packing up not on the rather nice picnic table 10 yards from our tents. Rain stops promptly as soon as we have started and got back to the disused railway line path that the GR 48 follows as far as L’Isle Jourdain where the path continues over the high viaduct over the Vienne to go west and south to who knows where. We descend a flight or two of very steep steps to the road below and are stopped by a French couple in a car driving up and down, who ask us, I think, if we have seen their escaped ram. It is white and had horns and was definitely “un mouton”. Alas we had not seen him but promise to look out, we asked every flock of contented sheep we passed but not admitted to seeing him. The Vienne at L’Isle Jourdain is very picturesque with barrages and weirs increasing its size and with a multi arched bridge dedicated to St Sylvain with a fine statue of him on it. It is however too early on a Sunday so we fail to find a bar to sell us a cup of coffee at this hour. So far the day had been easy walking but now, leaving the shelter of trees and the easy level progress of the old rail bed we find the GR starts to follow a line a mile of so east of the Vienne up on high ground a couple of hundred feet above the river, unfortunately multiple small streams join our river each in its own steep sided little valley accessed by green lanes with still air, of a humidity comparable to a tropical rain forest. Occasionally we would come out on to the tops and walk through fields with a reasonable breeze and dry out but mostly perspiration dripped off being unable to evaporate. The majority of the way from just before L’Isle Jourdain until many mile after we can hear the sound of racing cars on the ‘Circuit Automobile’ near Le Vigeant. How do the locals stand it? The noise contaminates a vast area of countryside. Eventually we dropped down to the Vienne again having covered around 15 miles and arrived gratefully at the front gate of the campsite, pleasant and on the bank of the river again. An early start this morning after being awoken by a (single) noisy lorry going past at 4:50 followed by a very local cuckoo who wished to be noticed. After breakfast from the boulangerie in the town, then up the hill and off, past the books & writing area of town (never did quite figure that out), past the infirmary for pilgrims and out to the agricultural college. This being Saturday morning it was very quiet (does it take long to teach French farmers how to fill in EU farming grant forms), and we were soon out onto the green lanes. These made a very pleasant way of getting the 8 or so miles to Lussac-Les-Chateaux. This was another delightful town which the GR approached via the old (ie small and winding) roads into the town. As it was 11am then a coffee was duly ordered in a bar in the square. The route from here followed the old railway line south alongside the banks of the Vienne river. This we had not seen for days so greeted like a lost friend. The tree lined sides of the old railway line were most welcome as by this time the temperature was staring to rise. This was only really noticeably when you came out of the trees. At this point we tended to speed up and dash to the next area of shade. Along the route was the superbly renovated old station at Persac (still with the station name engraved over the front door lintel). Don’t know if the deeds of the house prescribes them to mow the area of GR that goes through their land, but it was certainly well maintained. Come mid afternoon we ambled into Moussec a small village of 700 souls, 2 bars, a village store and a camp site. The camping fee for the night for both of us is 3.90€ which would have been the lowest camp fee we had ever paid if the camp fee at Montmorillon hadn’t been 3.35€. How can they run these sites at such a low cost? For that you get hot showers plus all the normal facilities. Tomorrow we hope to follow the old railway further south, if we can find it ok. The Vienne is still a sizable river at this point about the size of the Severn at Bewdley and all the rivers in this region are fast dropping to their summer levels. The campsite is next to an old broken weir and a few canoeists produced nostalgic memories for one of us. Tomorrow we are into Limousin a new department and need to brave the vagaries of a tourist office to get more info re campsites so we have some idea of were Geoff will meet us. A good easy day down tracks and roads alongside the Gartempe a nice little river about the size of the Wye at Hay but not as fast flowing. It is held back by small weirs, the site of past mills at regular intervals, and over looked by relatively small but well preserved chateaux at times. We saw a hare that did not realise we were there for about a minute long enough for a recognisable photo, and several deer plus a strange looking duck on the river at Montmorillon, email to Freddie for ID. Grey misty warm morning start but brightened up mid afternoon to allow us to see the medieval town at its best. Montmorillon is about the size of Stourbridge with a population of 7000 inhabitants, but serves a large rural area and has a hospital (modern working) that was founded in the 13th century to care for sick and injured pilgrims on their way to Compostella, by a local noble returned from his own pilgrimage to Jerusalem. Happily we have not needed its resources yet. We shall dine tonight on local trout (possibly from the river) with rice salad, accompanied by a £2.50 bottle of local Tourraine Sauvignon. All cooked on one little petrol stove, food and wine definitely a priority Geoff. La Roche-Posay to St Savin. A very good day, two in one, we had planned to get to St Pierre de Maille (about 12 miles) but we started early and were there feeling well by 1130 so pressed on with the help of the local paths organised by the local boroughs instead of the GR that was meandering all over the countryside. We know that if you wish to see the French countryside then following the red and white GR marks is excellent and takes you to all the important spots in an area while passing through it. However if you wish to pass through pleasant countryside with a purpose of getting from a-b then it is not optimal. We have covered in a day and 20 miles, what would have taken two and around 35 miles by sticking closely to the GR48. A number of young dear were disturbed when they were dozing in corn fields and it was amusing to see them run away with just their heads appearing at each bound through the field. A text to Tim from Geoff Fisher who should be trying to find us in about 10 days time reminds us that we were going to give reports on the kit we have brought with us as well as some specific requirements for those mad enough to try to join us for a while. Our accommodation. The two Terra Nova Laser Competitions have performed very well no major problems, one has a small crack in one of the critical hoop poles but wire and tape have prevented any deterioration and we now carry a spare pole set . They are quite damp with condensation in the mornings (I think we have had 2 completely dry nights) in terms of packing up into their bags, but this is not a major problem as either at mid day during lunch or on setting up mid afternoon they are dry. I would not however like to pack them wet and then put them up in the rain as a sole shelter. THEY ARE ONLY BIG ENOUGH FOR ONE PERSON. Any attempt to sleep more than one will be doomed to discomfort and sleeplessness, although this is not from personal experience, and we have no intention of trying. The MSR Dragonfly stove Tim bought/borrowed of Mark is performing faultlessly it has mostly run on Coleman fuel with a short spell on unleaded which will recur during the trip. The MSR pan set the non stick coating of which there were dire predictions is actually very good. There are some minor losses of coat but it is still performing well with no pealing or sticking. NOTE FOR GEOFF AND ANY OTHERS JOINING US IT WOULD BE HELPFUL TO BRING ONE MEDIUM SIZED PAN ENOUGH TO HOLD A STEW FOR 3-4 AS THE BIGGEST MSR MAY BE A BIT MEAN FOR THREE OR MORE ON OCCASIONS. Otherwise coking and meals for guests under control, but need own plate mug and eating tools. Tim’s Penknife from Penny in multiplle daily use. Thanks again. Tims Blacks Dolomite Trecking were still waterproof in their inside lining after 5 weeks of abuse. They had been wet through twice due to impossible conditions. Some stitching was starting to wear and some seams consequently looking as though failure in the next 5 weeks probable. So changed back to the KSB 600s I wore down the Severn to Somerset. These are not as waterproof a boot but breath better and are very comfortable, we are now on dryer terrain and they are functioning well. Rohan underwear, shorts and shirts are brilliant if expensive wash them wring them out and hang them up, dry in a couple of hours or less if not raining if raining stuff them in pack and hang up later still look like new (well nearly). Tony’s boots (from Blacks) which have only done about 600 miles needed some mending today as a small hole has occurred on the ‘toe crease’ on the right hand boot. This has been re sewn and covered in waterproof goo. If this doesn’t fix the problem then a new pair of boots will need to be purchased/found in the next few days. Not sure that the receipt for their purchase can be found or what Blacks’s returns policy is! We expect in 10 days to be level or just south of a line between Limoges and Angouleme and would suggest Limoges Airport if anyone flies there from UK. Otherwise its up to you Geoff. Le Grand Pressigny to La Roche Posay. A good days walk with little pain. Following the GRP route as this seemed more useful than the GR. Cool in morning so moving fast from an early start.. Woods and fields some deer in the forest and ? a kite in the forest. Also a large black rat glimpsed scuttling off by the river as we approached La Roche-Posay. We were in the valley of the Claise last night and this morning passed over the low ridge between and back to the Cruse. South though ever south. In the field next to last nights camping was an archaeological re enactment site probably to do with the chateau on the hill that is a closed museum of prehistory being renovated. There was a mud and stick dwelling and a large wigwam structure covered in animal skins. We also met a very friendly Frenchman who was determined to teach us some French in return for a few extra words of English he did not know, though I think there weren’t many we both learnt “swarm of bees” in each others language. He also made very good omelettes with fungi he had collected in the woods, we all ate it. Tim was the guinea-pig. Still here though! He also confirmed our impressions of increasing numbers of French speaking English, the times they are a changing. About 14 miles brought us to La Roche-Posay, a small spa town that is quite pleasant but like most spa towns thinks a lot of itself. We have managed to get another vital document out of the tourist office; the list of campsites further south on the route. You need to be a bit persistent to get this, though they will give lists of hotels and chambers very easily, still that’s what they are for I suppose.